A combination of major new conflicts and unresolved ones around the world are increasingly straining humanitarian resources at unprecedented levels, the head of the United Nations refugee agency warned today. “Already in 2011, as crisis after crisis unfolded, more than 800,000 people crossed borders in search of refuge – an average of more than 2,000 refugees every day. And this was higher than at any time in the last decade,” said UN High Commissioner for Refugees António Guterres, at the opening of the annual meeting of the agency’s (UNHCR) Executive Committee in Geneva. Mr. Guterres said UNHCR’s capacity to help the world’s forcibly displaced was being “radically tested” by the acceleration of the crises, with more than 700,000 people having fled from the Democratic Republic of the Congo (DRC), Mali, Sudan and Syria this year alone. Mr. Guterres praised the countries that have kept their borders open to people fleeing conflict, and thanked donors for continuing to provide generous support during a period of global economic strain. However, he warned that the costs of helping the world’s more than 42 million forcibly displaced were escalating fast, with protracted large-scale displacement situations continuing in places like Afghanistan and Somalia. UNHCR is putting in place new measures to improve its efficiency, Mr. Guterres said, such as cutting back on non-essential procurement and tightening control on replenishment of aid stockpiles. In addition, the agency, which relies on voluntary contributions, is seeking increased funding from non-traditional sources, including the private sector, as well as partnerships with civil society organizations. In addition to finding political solutions, humanitarian actors should also help improve the prospects for peace including through advocacy, education and other activities to facilitate self-reliance among refugee populations, Mr. Guterres said. Currently made up of 87 members, UNHCR’s Executive Committee meets in Geneva annually to review and approve the agency’s programmes and budget, advise on international protection and discuss a wide range of other issues with UNHCR and its intergovernmental and non-governmental partners. The meeting of the Executive Committee runs through 5 October. 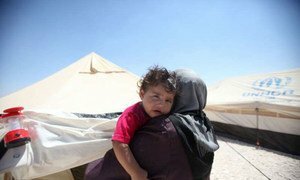 The United Nations and its humanitarian partners today issued a revised appeal for nearly $488 million to assist the rapidly increasing numbers of Syrian refugees in Jordan, Lebanon, Iraq and Turkey.